This is the first post in a series called Friday Food Finds (FFF). Every few weeks – on a Friday – you can expect a post about a store bought food find that gets my stamp of approval for taste, convenience, and at least a good-enough nutrition profile. It will be a food that either I enjoy or feel good about recommending to my clients and readers. My first Friday Food Find is a healthy dip for veggies or a sauce for lots of foods. I think you’re going to like Trader Joe’s Tzatziki, a creamy garlic cucumber dip. Tzatziki is a dip or a sauce common in the Middle East, Greece, and other European countries. It’s a combination of yogurt, cucumbers, lemon juice, garlic, dill and mint. Make it yourself: I frequently make my own because it’s really quite easy, and you don’t need to stick to a recipe. Dice up or grate some cucumber, crush the garlic, and add them to your plain yogurt. Snip some fresh dill and mint and squeeze in some lemon juice. Taste and adjust. You might also want to add some salt and finish with some delicious olive oil. If you want a tangy, healthy dip for veggies, tzatziki is perfect. If you have the time to make it, here’s a recipe for tzatziki from the Kitchn. I would use less olive oil or simply omit it from the yogurt mixture and add a drizzle as a finisher. Say yes to a healthy dip! I show tzatziki here with raw vegetables, but most often I put a spoonful or two on a crab cake, black bean burger, chickpea patty or even use it as a salad dressing. It offers such a wonderful tangy flavor and reminds me of foreign travels. My Easy black Bean Burger has been super popular on the blog, and some tzatziki on top makes the bun irrelevant. Pick it up: Even though homemade tzatziki is easy to make, it’s not always convenient with my schedule. So now and then, I pick up the Trader Joe’s brand. And the taste definitely doesn’t disappoint. It isn’t made with the usual ingredients. This brand has a base of kefir cheese and sour cream and contains some gums and thickeners that I’d prefer to leave out. But they are safe to use (unless you have a specific sensitivity), and I’m not worried by them. I really like the Nutrition Facts, which show only 30 calories, 1 gram of saturated fat, 65 mg of sodium, and 2 grams of carbohydrate in a generous 2-tablespoon serving. 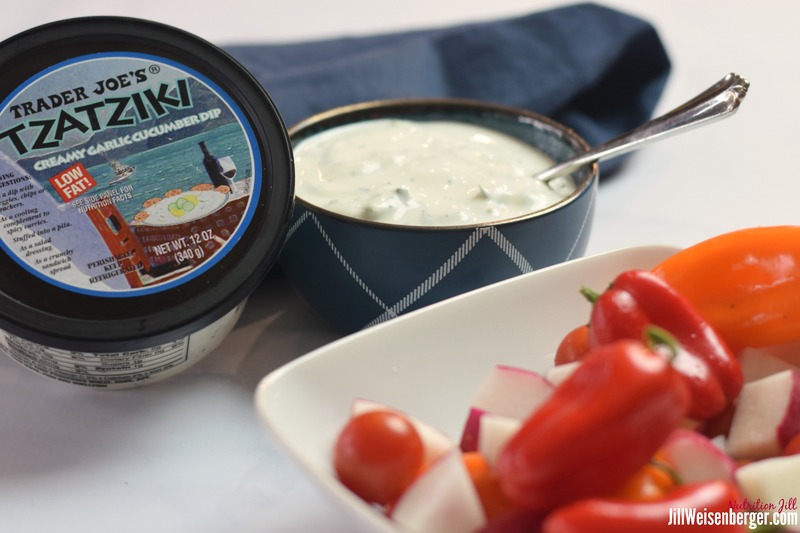 Tzatziki is delicious and changes the entire flavor profile of a dish. If you don’t have time (or inclination) to make your own, pick some up. I think you’ll like it! Do you have a favorite way to eat tzatziki?